Vivaldi’s Four Seasons may be the most widely heard piece of classical music ever composed. As the composer Max Richter suggests, “The piece is part of the musical landscape, and a part of my daily life. I hear it in supermarkets, and it’s always turning up in TV ads.” He has approached his “Vivaldi Recomposed”-project as an admirer of Vivaldi, but no less importantly, as a composer. “Anything that a composer writes is part of a conversation with music that has gone before,” he says. Affection is an integral part of Max Richter’s Vivaldi Recomposed. His “post-classical idiom” draws inspiration from influences like electronic music, punk, club music, psychedelic rock. 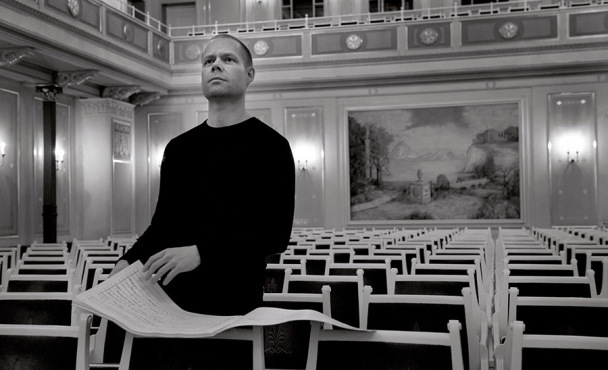 Max Richter’s co-conspirators are Daniel Hope, the British violinist; and the orchestra “l’arte del mondo” (artistic director is the violinist Werner Ehrhardt). Two films were produced as part of this project. The first is a specially staged performance of the entire Recomposed piece in the former Easter German State Broadcaster’s studio in Berlin and the other a 52 minute documentary exploring the genesis of the recording while also giving some background to Max Richter and Antionio Vivaldi.